On the Cover: The bright "pinwheel" of comet Hale-Bopp appears against the background of stars in the constellation Sagittarius in this image taken by the Hubble Space Telescope in October 1995. The comet is rotating about once a week, so evaporated debris ejected into space is flung out like water from a lawn sprinkler. This comet appears to be a large one, and some astronomers have dared to hope that it could be the most spectacular comet of the century. It is falling toward the Sun at about 54,000 kilometers (33,500 miles) per hour and by early 1997 it should appear as a bright streak hanging in the sky. 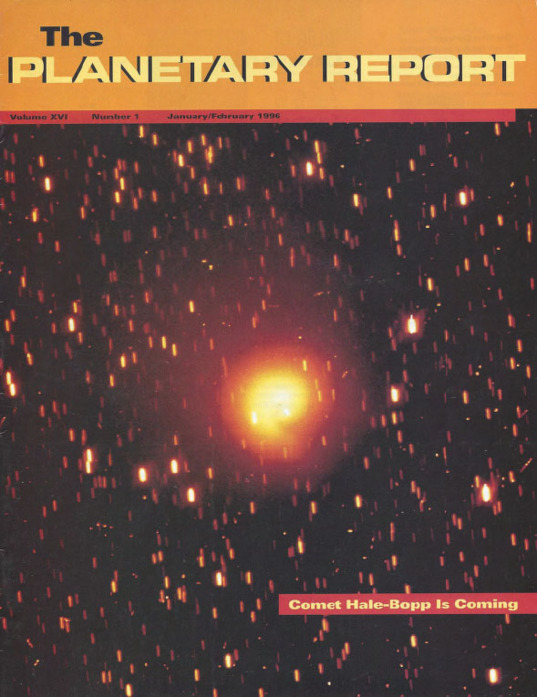 4 Comet Hale-Bopp: Coming to a Sky Near You: Don Yeomans, one of the world's experts on cometary trajectories, shares his latest thinking on this approaching comet. 9 Mars Pathfinder: Blazing a New Trail: Matt Golombek describes this mission, part of NASA's new "smaller, cheaper, faster" missions plan. 10 Mars Global Surveyor: What to Look for in the Results: Mike Malin explains how this mission will achieve many of the goals intended for the lost Mars Observer spacecraft. 12 Mars '96: Science and Exploration on a Grand Scale: V. I. Moroz outlines the ambitious suite of instruments planned for this Russian mission to the Red Planet. 15 World Watch A summary of planned planetary exploration in the next decade. 16 Basics of Spaceflight Electromagnetics: the phenomenon that makes planetary science "doable." 18 News & Reviews Why it pays to spend time browsing the internet. 19 Society News The Mars Underground, M.A.R.S., and Society online services. 20 Q&A Water on Europa; the Cretaceous/Tertiary impact.